Whether they function as breakfast bars, cosmetic holders, or cooking surfaces, countertops are an integral part of every home. Because they get used so much and are a focal point in any space, it makes sense to invest in the kind that last long and have a design that suits your aesthetic preferences. We make that easy by stocking a showroom full of different countertop materials for kitchens and bathrooms. Homeowners of all budgets and design preferences can easily find the perfect selection, especially with our financing options and knowledgeable staff. Though they may be used for different purposes, kitchen and bathroom countertops have some of the same requirements. Both need to be able to handle large amounts of moisture, stand up to heat, and impress any visitors who see them. Our products easily offer all of that and more. We have a team of experts ready to take you through our showroom, guide you toward samples of our best bathroom and kitchen countertops, and provide information on each. Schedule a free consultation and we’ll be better equipped to find you one that ties in with your décor too. Granite countertops are one of the most desired choices for all kinds of homes for practical and aesthetic purposes. The material can be made with a number of patterns and colors, and its excellent endurance under heat makes it perfect for kitchens. Granite also resists scratches and bacteria, helping you keep it stunning and uncontaminated. We can easily custom-cut it for your space and coordinate it with whatever theme you’ve got. Once it’s installed, you can count on having your granite countertop for decades. Another popular pick are our quartz countertops. Like granite, quartz is strong, stain and scratch-resistant, and can work in any setting. This nonporous material offers long-term durability and high performance from day one. Whichever you choose, you can count on us to design and install it exactly how you want. We have a team of talented artisans and countertop experts who create your custom template and make it to order with your choice of edge style and finish. 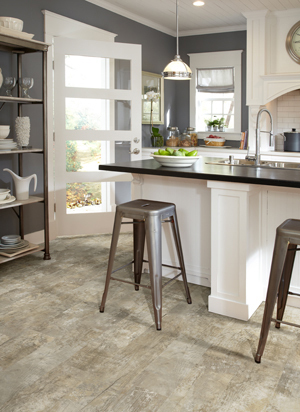 Like floors, countertops depend on quality installation to perform well for a long time. It’s important to us that you get what you pay for, which is why we urge you to hire us for countertop installation. We know our materials better than anybody and have the skills and technology to install any countertop in any space. Schedule the work at a time that’s convenient for you and we’ll show up on time and ready to go. From the grandest kitchen to the tiniest bathroom, we’ve worked with them all. Our work is professional and completed correctly the first time, with no mess left behind and your design wishes granted. You’ll be amazed how one change can make all the difference. Contact us for a complimentary countertop consultation. We install them for homeowners from Bedford, Manchester, Hooksett, Concord, and Hollis, New Hampshire, and the neighboring communities.